Snapes Project Logistics has always invested in systems and processes. It has always been our belief to work smarter. It is also our belief to provide win/win outcomes for our customers, and ourselves. Innovation is the new frontier of Australia. Following the industrial revolution, technology is the new critical success factor for business – to remain competitive, maintain key staff, and to operate efficiently; to ultimately improve performance and to scale. Many State Governments are supportive of businesses investing in innovation and future-proofing, and we have been fortunate to tap into much needed grants to make some of this possible. Major lenders also require detailed business plans, only approving sound investments – all of which has helped contribute to our ability (together with our own R&D budget) to fund projects for new tech and system upgrades. One-size-fits-all has never been our model. While there are some merits to cut costs by offering generic products and services only; commercial projects are a constantly moving event influenced by varying factors such as equipment, stages, multiple sites, downtime … and the list goes on. Our clients do not fit the common mould, where their customers and the expectations of their customers are constantly changing and increasing. Flexibility is fast becoming the new “generic”. Databases and systems are critical tools to managing client requirements and project complexities. Business intelligence is crucial, enabling management to make more informed decisions (rather than gut-feel). Knowledge is critical and having the right tools at your fingertips is invaluable when reporting on and analysing data on sales, output and DIFOT to improve business performance. 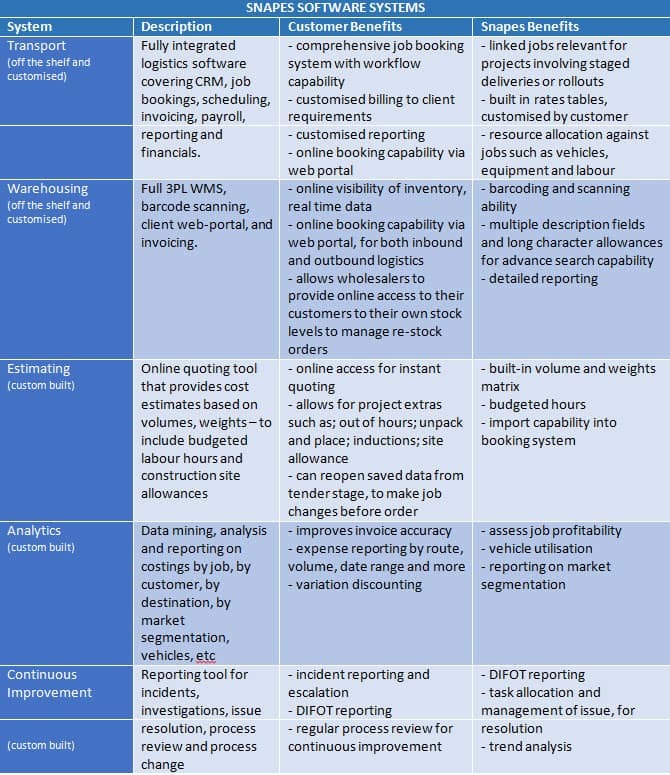 Tabled below are some of our systems; listing both our benefits as well as those relevant to our customers.